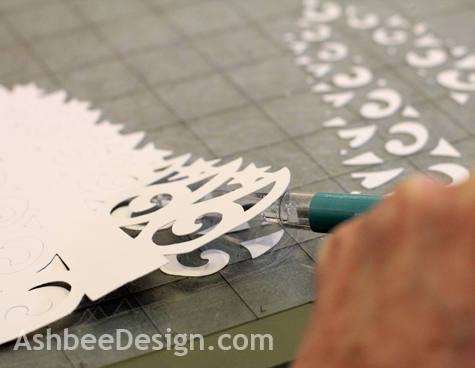 I am starting to get the hang of my new Silhouette cutting tool. I am exploring more of the software tools and learning as I go. My third project is based on a simply beautiful design I found on Pinterest and had saved in my Christmas Ideas folder. 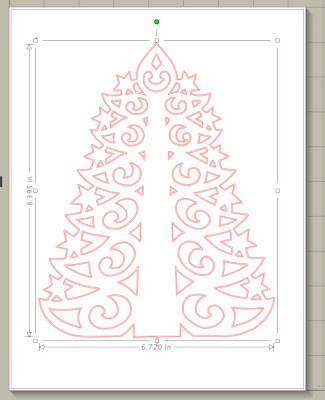 I used the shared .pdf template from Ninuska, learned how to import it into the Silhouette software and transfer it to cutting lines to create this lacy Christmas Tree in white card stock. The design of the lace pattern is not mine but offered for download on the Ninuska blog here. The craft person demonstrating cuts this beautiful design out by hand and if you don't have a cutting machine, you can as well. Gotta say, I am glad I have a cutting machine! What I did with the design was to download the pdf at the above site. I then opened it in photoshop and filled the outline with black. I didn't do that first time round though. There was a learning process of course. I opened the file within the Silhouette software, investigated in the help files how to trace an imported design. 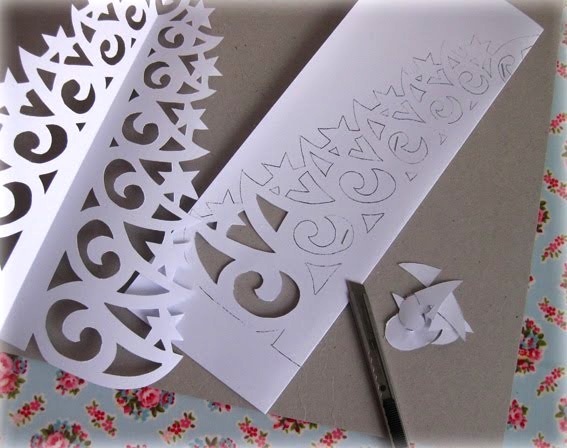 I followed them and came up with the following cutting pattern. Notice how each line is outlined on both sides? 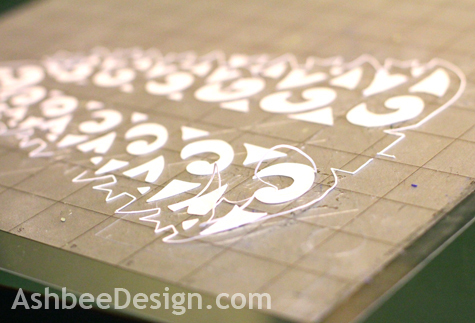 That translates into every line being cut twice with a slight space between them. I was fairly sure this wasn't what I wanted. I played with the various trace settings and couldn't get it to read the black lines as a single cut line. I decided to try the cut anyhow and see what happened. 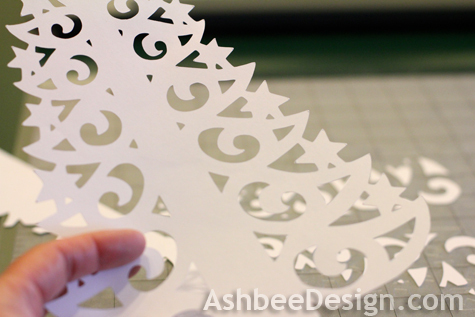 Yup, the tree cut but there were all these double cuts leaving a filigree ribbon. After a little Googling I decided the shape need to be filled with black. 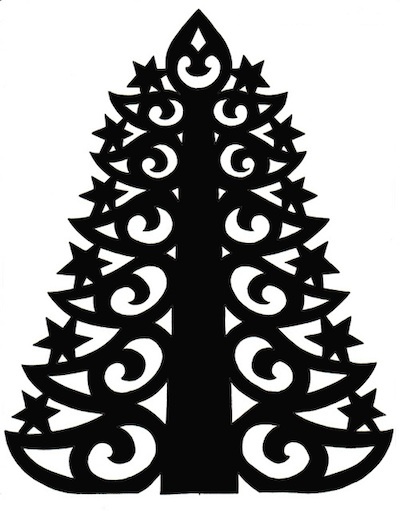 After exploring the different tools in Silhouette and being unsuccessful in filling the shape, I opened the pdf in Photoshop and filled it with black. 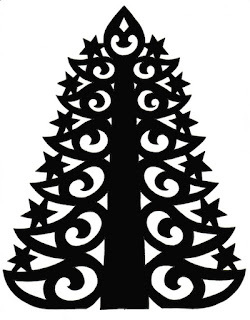 The trace command worked beautifully with the default settings and I cut out two trees using the Silhouette. MUCH faster than with an exacto knife! My skill at separating the paper from the mat has improved and I didn't experience the tearing problems I had on the first project. I don't pull the paper off. Instead, using the little chisel tool that came with the cutter, I pry it up from the bottom side. I sneak the plastic chisel under and the paper lifts. The other change is I arrange my paper and the mat so the feeder rolls don't press on the paper but instead track on the edges of the mat. 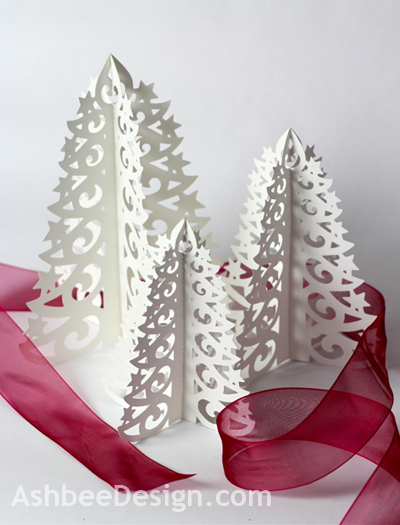 I cut two identical trees and then, using my sewing machine, I stitched them together right up the center. I folded them along the stitched seam on both sides to create a standing tree. 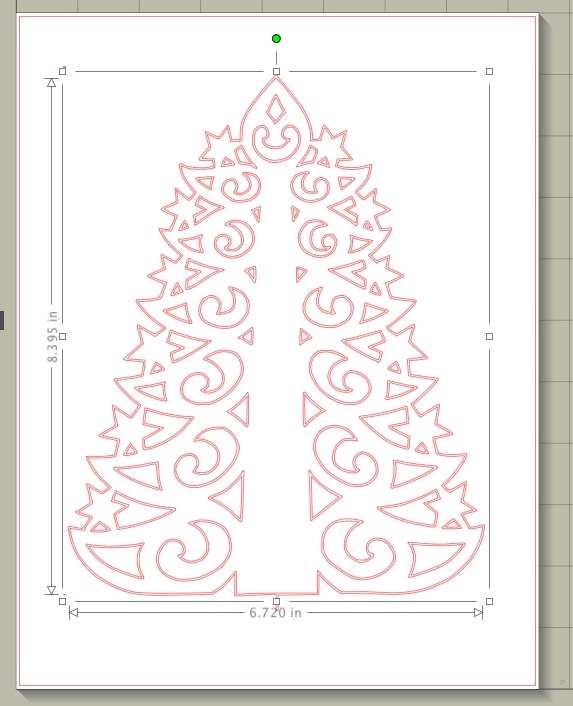 Using the re-sizing tools built in to the Silhouette software, I reduced the pattern, cut two trees, reduced it again and cut two more. 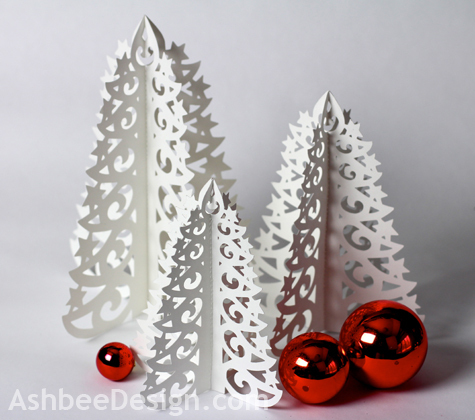 This created three trees of different sizes. The display potential of these delicate trees is endless. Right now I have them on the coffee table between the sofa and the wood stove. There! My first Christmas decoration is in place. I think I need to build a fire. It is snowing outside. Time to sit, enjoy a fire, some hot chocolate and admire the trees, both inside and out! I got so excited by this project that I made 11 trees this afternoon - 3 for me, 3 for each daughter and 2 to give as singletons to friends. They can be a gret hostess gift. Wow--you've made great progress in learning how to use your Silhouette. This is a beautiful project. I, too, was a bit disconcerted the first time I tried to trace a line drawing and discovered the software traced on both the inside and outside of the line. This feature does come in handy when you want to cut words in various fonts. Thanks Judy. Still learning. Wondering what everyone has found to be the best selection of tutorials and help for the Silhouette online. Suggestions anyone? AMAZING!!!!!!!! I just LOVE IT!!!!!! I want them... yes all three of them! And a hidden bonus is that they store flat so they are easy to keep for next year! It truly is more than I hoped for. It opens up a world of creativity and my mind is spinning with the ideas! Gorgeous! 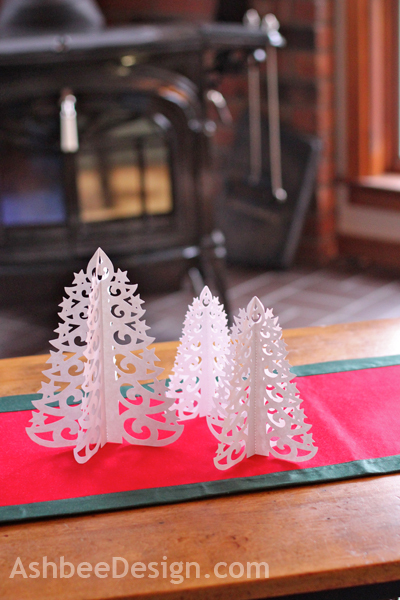 I need to get my Silhouette out and make these. I am just learning so my Silhouette has a permanent place on my desk. So many ideas....so little time! Patty, Great idea for secret Santa. I keep making them and giving them to special folks at special events. Everyone loves them. And, because they fold flat you can slip them into an envelope. That will make wrapping so much easier!! Oh wow you are certainly getting the hang of this machine....wonderful trees. Oh WOW!! They really are Beautiful. Pinning! 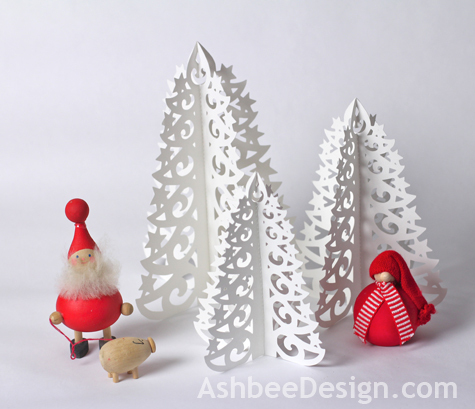 I just started a Pinterest board for silhouette ideas- my newest craze! 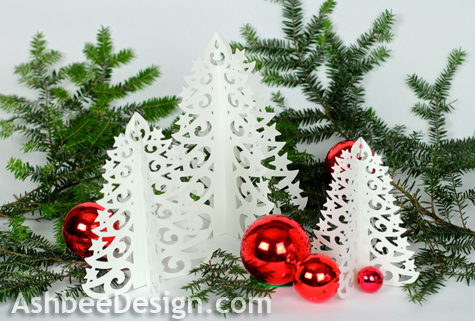 Thanks Marlis, and send pictures if you create a gorgeous tablescape with the trees. These are so delicate and beautiful! Hi Marji! This are really adorable. One of these day I will get me a silhouette. I'm having a, "It's a Social Hop like Crazy" party. 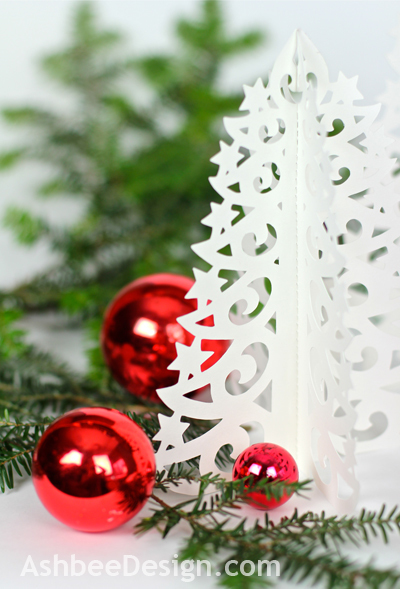 I'd love for you to hop on over, grab a button and link up your blog. Marji, those are SO pretty! Thanks so much for taking the time to tell us about your learning process. 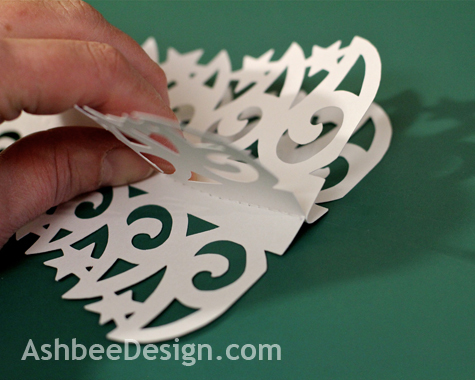 I still struggle with ripping card stock on my Silhouette, but will give your method a try. And I wouldn't have thought to stitch the trees together, but it worked perfectly. Thanks for sharing on Sweet Sharing Monday! I've received several e-mails from others about the ripping. They suggest pressing your hands all over a mounting mat before using it. The oils from your hands helps with the over sticky problem. I'll try when I get a new mat. I have found that the mat gets less sticky and works better. I expect it will get to a point where it isn't sticky enough but I'm not there yet. I would love it if you linked up your lacey trees. I totally commend you on a job VERY well done! I cannot do things of a "craft" nature to save my little soul!!! I just don't have the patience...or the steady hand! I'm sure there would have been a trip to the ER involved if I had cut those trees out! :-) And then you SEWED it! That would really be a disaster if I tried it!!! My hat's off to you! 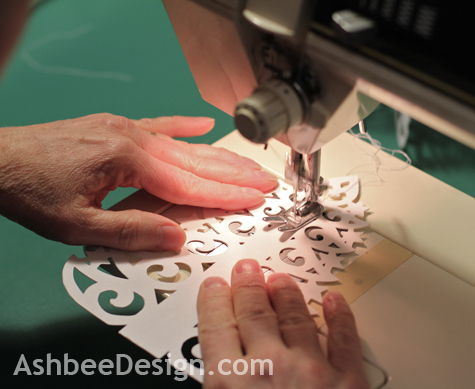 (I had no idea that you could even sew paper!!!) These trees have a very professional look to them! Happy Holidays! Thank you for posting these. They're beautiful and I'm headed upstairs to cut them out w my Silhouette now! Absolutely gorgeous! Looks like it took a bit to figure it out, but well worth the effort. super cute! I will feature this at somedaycrafts.blogspot.com because it was the most viewed link at the Whatever Goes Wednesday party last week, Congrads! These are beautiful! I'm getting a Silhouette any day. I can't wait to make this. Great job, and thanks for teaching how to change a regular image into something that can be used on the Silhouette! I'd love it if you shared this at One Creative Weekend on OneCreativeMommy.com. I went to the website you mentioned and can't figure out how to download the pdf file for these trees. Is it possible to download it from your site?